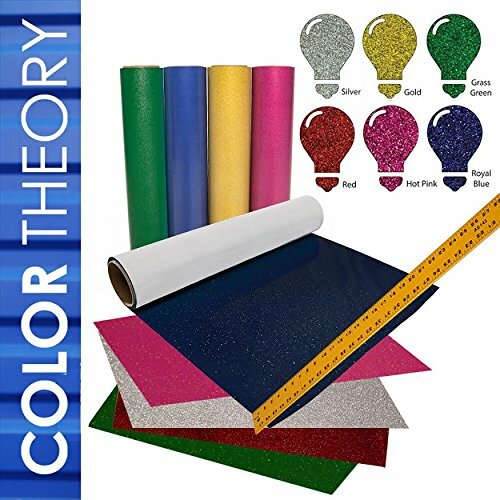 Color Theory Glitter Heat Transfer - 6 Color Starter Kit, 20" x 12" ea. Color Theory Glitter is a high-quality richly colored, textured, sparkly heat transfer vinyl for CAD/CAM cutting and is suitable for decorating cotton, polyester, or cotton/poly blend garments. This adds the perfect touch for gymnastics, cheer, and dance apparel. For use in a majority of garment applications, including on cotton, polyester, and blends. For fashion style garments, cheer and gymnastics apparel and events, tote bags and more! Testing: Always test on a fabric swatch prior to production, especially on heavily treated fabrics. Please check our other kits for more colors. For fashion style garments, cheer and gymnastics apparel and events, tote bags and more! If you have any questions about this product by Greenstar, contact us by completing and submitting the form below. If you are looking for a specif part number, please include it with your message.